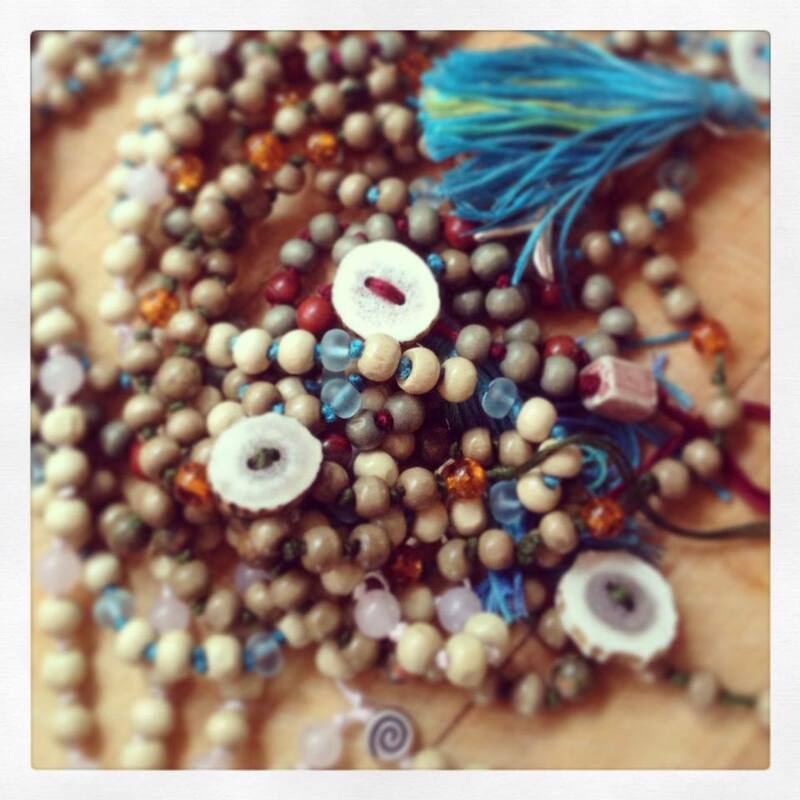 I began creating Malas, in the form of wrist mala, about 6 years ago as part of my ‘Immerse in Elen’ Retreats. Having practised yoga for a number of years I had learnt the art of Mantra and Mala Beads as an aid to meditation, plus I’d always loved Chant as part of my Pagan/Spiritual Path. Knowing that quite a few religions use prayer beads/rosary I decided to devise my own. I wanted attendees of the Retreats to be able to take home some daily devotionals; tools they could use simply to connect with Elen. So over the course of the weekend we make ‘Elen of the Trackways’ wrist malas and learn Her devotional Mantra together. Mala are generally made from different materials such as tulsi (basil) wood, sandal wood, rudraksh seeds or crystal. Each type of material has certain properties which subtly affect the subconscious mind of the practitioner. In the construction of the Elen Mala Bracelet I wanted to incorporate natural things that I strongly associate with Elen. 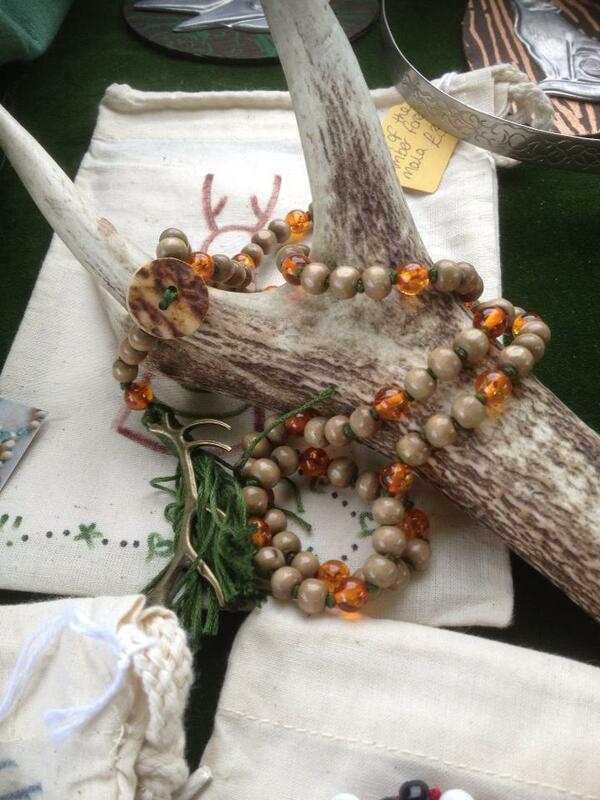 So I created the bracelet from wood (oak), amber and antler. It can then be worn as a wonderful accessory to meditation, which when used regularly with a personal mantra, absorbs the vibrations of the practice. It becomes like a close friend or a comfortable piece of clothing. Meditation can be quite a tricky practice because the mind is like a naughty child. By its very nature, the mind tends to wander off during meditation practice. If ones energy is low at the time of meditation, falling asleep can result. If the energy is too high, fantasy and distraction become the barriers. At such times, the mala provides the much needed anchor. The mala beads are moved in rhythm with the breath and the mantra, so that both-sleep as well as excessive mental distraction-are prevented by this action upon the beads. On a traditional Mala there are 108 beads….there are so many suggestions and reasons for the reputation use of 108…..too many to list here. But if you look into this website there is a huge list from many religions, cultures and studies. 108 has been used for an awfully long time so who am I to argue with this! Here are a few a like though…. 9 times 12: Both of these numbers have been said to have spiritual significance in many traditions. 9 x 12 = 108. Also, 1 + 8 = 9. That 9 x 12 equals 108. How Do I Hold/Use Mala? The mala is traditionally held in the right hand and used in two ways – In method one; the mala is hanging between the thumb and the ring (third) finger. The middle (second) finger is used to rotate the mala by one bead towards oneself with each repetition of the mantra. In the other method two, the mala is hanging on the middle finger, with the thumb used to rotate the mala just as explained – one bead at a time. Either way, the index finger is never used to touch the mala. 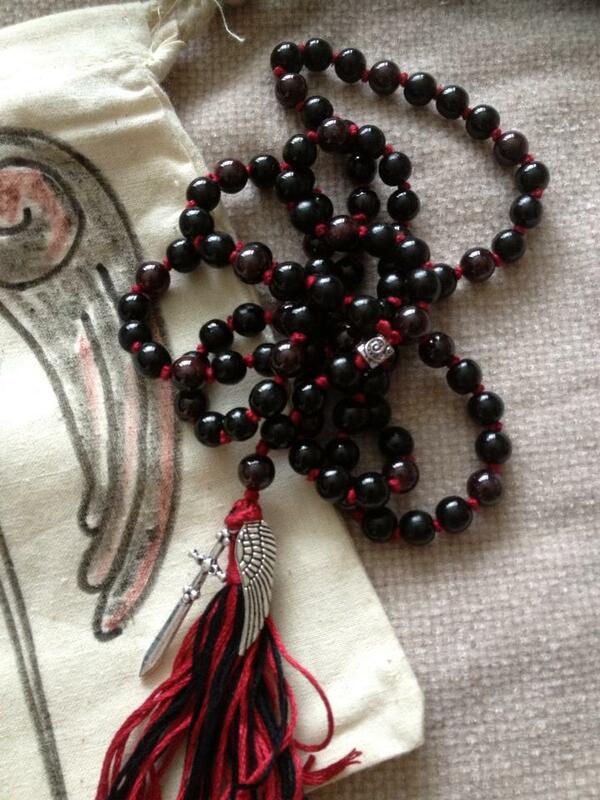 So as well as the magic 108 beads each Mala has a ‘Guru’ bead, on my Magical Malas these can be made up of a number of things depending on the theme of the Mala itself. The deer related ones tend to have a piece of antler, some have a larger bead or a silver spiral and some recent ones have fossilised ammonites’. The Guru bead is said to represent the student-guru/deity relationship and this is where you start your practise, it’s a contemplation point, the place to breathe and focus before you start working your Mantra/Chant. Magical Malas come with a coordinating tassel on the end; I create mine using 21 binding threads. Most of my Malas are made with a combination of 3 wooden beads and 1 gemstone, 3 x 7 = 21 hence why I use 21. The significance of the Tassel is purely decorative; although on a practical level once you reach the tassel you know you have completed the practise. The more you use your Mala the more embedded with your intentions and energies and the Tassel picks up those too, so once you have completed your round you can touch the Tassel to your 3rd eye and heart space silently giving thanks. All my Mala themes and accompanying Mantras are of my own design. Inspiration comes from the Land, Deities and Animal Guides; and the call to make a particular design can come from a customer commission or seeing a fox/heron/hare whilst out walking. The call can come at any time and I have to create it! Every Magical Mala comes with its own hand painted natural cotton pouch, instructions and art card with Mantra printed on it. If you’d like to know more please comment or check out Magical Malas Facebook page. So lovely! How or where would I order? Much thanks! Hello! Its possible to contact Sam via the Facebook page. Sam is just about to move to Scotland so there is a wait on orders at the moment.